After continuing our journey with John Crichton last week with the second season finale, “Die Me, Dichotomy,” our Farscape re-watch continues this week with the first two episodes of Season 3. 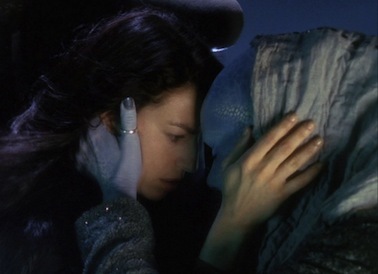 “Season of Death” had an enormous, unenviable task, which was to follow up on an episode that wasn’t only Farscape‘s greatest to date, but one of the best season finales of all time, filled with some of the most exquisitely crafted cliffhangers ever done in any television serial. These cliffhangers were so massive that the series had almost seemed to have written itself into a corner, not unlike the first season finale. How could those pieces possibly be picked up in the next year? How could John survive? How could the show go on without Aeryn? And while I’m not sure if it would be possible to completely live up to audience expectations in every way, “Season of Death” does a superlative job of bridging the gap between seasons two and three and resolving the loose threads, while also both beginning to set up the third season’s epic arc and managing to carry “Die Me, Dichotomy”‘s sense of opera through from the previous episode into this one. A great many major events occur in this episode, in rapid succession, almost too many to fully process on a first viewing–a Farscape tradition–and so while I recall being slightly baffled and even slightly underwhelmed the first time I saw it, my estimation of it has risen dramatically with later viewings, to the point that I now consider it an absolutely brilliant installment. It just requires some time to really evaluate it, as well as a knowledge of what happens later on in the series, in order to place it in its proper context. For example, one of the things that might disappoint viewers the first time is how relatively easily the dilemma regarding how John is to be cured us is shown to be. While it seemed that when Scorpy breathed into the very sensitive creature’s face that it had instantly died from the germs, in actuality, it was only on the brink of death, and so they are able to revive him via mouth-to-mouth resuscitation, along with the sterilizing green light surrounding John. But when you think about it, they actually did play completely fairly. Although we assumed that Tocot was dead as soon as he hit the floor–as we were supposed to–it didn’t mean that he necessarily wasn’t simply unconscious and dying, rather than fully gone. Further, because episode writer David Kemper had established how the green light works, it fully stands to reason that, should the Diagnosan be restored to consciousness and bathed in the light, that he could recover. Farscape got away with a similar trick at the start of season 2, regarding how they resolved the season 1 finale cliffhangers. It isn’t about coming up with the most outlandish way imaginable to work your way out of a cliffhanger. Sometimes the simplest works best, and in this case, the clues were already there. We had just been deliberately distracted from noticing them. The fact that Tocot seemed dead but was actually not is also woven into and reflects a crucial thematic aspect of the episode, which is the revelation that many of the “donors” kept on ice by Grunchlk aren’t actually as fully dead as he had claimed. It’s unclear whether or not “the doc” is aware of this or not, but it becomes increasingly apparent that Grunchlk was in at least some cases freezing people who weren’t actually about to die–as we discover with Jool in the season’s third episode. Even the fact that he freezes them right before death rather than after implies that there could be a chance, however small, of saving some of them, except it’s not in Grunchlk’s interests to pursue that, as they are much more profitable to him as potential organ donors for rich clients. A horrified Stark reveals that many of these peoples’ souls are crying out in agony, trapped for countless years between this plane and the next, instead of being allowed to move on. He even himself disconnects one of the Interions–one of Jool’s cousins–instantly killing him, which he claims to have been a mercy, another example of Stark’s moral ambiguity, since it was also technically murder. Had he not done that, however, Crichton would have refused to allow Tocot to use the tissue sample from him in order to fix his speech. Later on, Stark will also dole out justice against Grunchlk by walking by the coffin in which he is frozen later on in the episode without saving him, even though he knows him to still be alive and healthy. The revelation that this technology is able to keep people alive, even with the most minimal of life signs, is then what specifically sets up what Zhaan manages to do in this episode. When Crichton is horrified to realize that Harvey is still in his mind, he communicates with Zhaan through unity that he wants to die, and she desperately attempts to accommodate him, before D’Argo and Stark manage to stop her. She instead then comes up with an alternate solution: rather than help Crichton die, she will help him live, by restoring Aeryn. By realizing that there is still the barest sign of life within her, she uses her 10th level Pa’u powers to reach into the Other Side and bring Aeryn back, despite Stark’s warning that Aeryn is much farther gone than the others. He can’t hear her soul at all. Unlike the others on the planet, she was frozen after drowning, rather than as a preemptive measure. And yet Zhaan knocks Stark out, in order to borrow some of his crossing-over energy and then manages to use her spiritual abilities to travel to the other realm, like Orpheus, and pull Aeryn out. It’s a truly ravishing sequence, Zhaan finding Aeryn’s soul trapped in perpetual motion, still falling in the chair in which she drowned, an operatic score once again playing in the background. At first, Aeryn doesn’t know her and simply recites her name, rank, and regiment, echoing her first lines in the series to Crichton, but then Zhaan’s soul shares unity with hers, which restores her memory and allows Zhaan to return her to her body and our world. When Aeryn asks why, she responds that it’s because she loves her. As truly beautiful as this sequence is, on a first viewing, one might still find it either easy or cheap from a narrative perspective that Zhaan is able to bring Aeryn back, seemingly with no consequences, after the huge impact of her death in the previous episode. It’s only in the last moments of the episode that we learn the true cost to this resurrection, and it’s only really three episodes later when this cost is finally paid that we might fully appreciate what the writers did here. Because it isn’t actually an easy solution at all. By bringing Aeryn back from the land of the dead, Zhaan violated the natural order of things, and in order to keep nature in balance, a price must be paid: her own life. By restoring Aeryn’s life energy, she uses hers all up. She remains weak and dying for the next two episodes and finally dies at the end of the third, sacrificing herself yet again even when a potential cure looms on the horizon, in order to save her friends. This immense cost, as well as Zhaan’s remarkable act of sacrifice, is what justifies Aeryn’s resurrection. Had she simply been able to recover with some bed rest or a cure, there wouldn’t have been true, lasting consequences to “Die Me, Dichotomy”. This, however, ensures that the events of that episode still leave an irreversible toll on our characters. There is no simple solution–Aeryn is back but Zhaan must die as a result–a theme underlined by the fact that we first learn of her imminent demise as she lies, weakened, in her rooms aboard Moya, which are still badly burned, seeming to be a visual reflection of her own mortality. Meanwhile, although John and Aeryn are reunited and free to be together finally, what happened to Zhaan also convinces Aeryn that they can’t pursue a relationship. She can’t bear the idea of their love potentially costing another life, whether it be another friend’s or one of theirs. She isn’t psychologically ready yet to accept that love can be a strength, rather than a weakness. And so things are far from hunky dory, on any front.